Tathagatagarbha, or Tathagata-garbha, means "womb" (garbha) of Buddha (Tathagata). This refers to a Mahayana Buddhist doctrine that Buddha Nature is within all beings. Because this is so, all beings may realize enlightenment. Tathagatagarbha often is described as a seed, embryo or potentiality within each individual to be developed. Tathagatagarbha was never a separate philosophical school, but more of a proposal and the doctrine is understood in various ways. And it sometimes has been controversial. Critics of this doctrine say that it amounts to a self or atman by another name, and the teaching of atman is something the Buddha specifically denied. The doctrine was taken from a number of Mahayana sutras. The Mahayana Tathagatagarbha sutras include the Tathagatagarbha and Srimaladevi Simhanada sutras, both thought to have been written in the 3rd century CE, and several others. The Mahayana Mahaparinirvana Sutra, probably also written about the 3rd century, is considered the most influential. The proposal developed in these sutras appears primarily to have been a response to Madhyamika philosophy, which says that phenomena are empty of self-essence and have no independent existence. Phenomena appear distinctive to us only as they relate to other phenomena, in function and position. Thus, it cannot be said that phenomena either exist or don't exist. Tathagatagarbha proposed that Buddha Nature is a permanent essence in all things. This was sometimes described as a seed and at other times pictured as a fully formed Buddha in each of us. 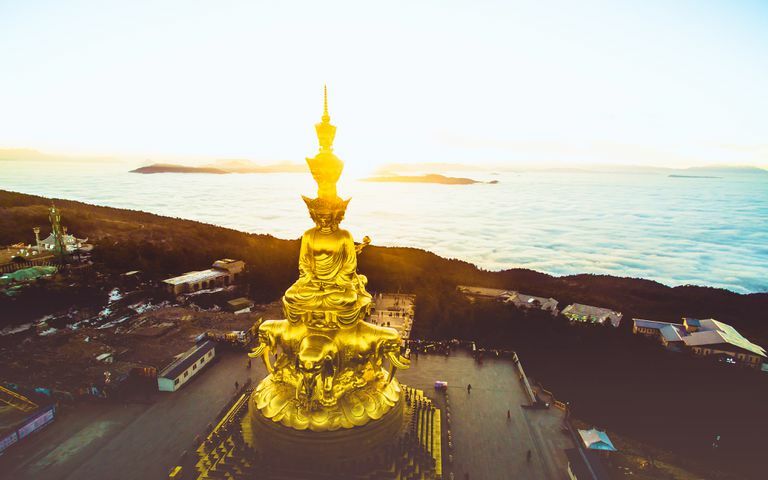 Somewhat later some other scholars, possibly in China, connected Tathagatagarbha to the Yogacara teaching of Alaya vijnana, which is sometimes called "storehouse consciousness." This is a level of awareness that contains all the impressions of previous experiences, which become the seeds of karma. The combination of Tathagatagarbha and Yogacara would become especially important in Tibetan Buddhism as well as in Zen and other Mahayana traditions. The association of Buddha Nature with a level of vijnana is significant because vijnana is a kind of pure, direct awareness not marked by thoughts or concepts. This caused Zen and other traditions to emphasize the practice of direct contemplation or awareness of mind above intellectual understanding. In the religions of the Buddha's day that were the forerunners of today's Hinduism, one of the central beliefs as (and is) the doctrine of atman. Atman means "breath" or "spirit," and it refers to a soul or individual essence of self. Another is the teaching of Brahman, which is understood as something like the absolute reality or the ground of being. In the several traditions of Hinduism, the precise relationship of atman to Brahman varies, but they could be understood as the small, individual self and the big, universal self. However, the Buddha specifically rejected this teaching. The doctrine of anatman, which he articulated many times, is a direct refutation of atman. Through the centuries many have accused the Tathagatagarbha doctrine of being an attempt to sneak an atman back into Buddhism by another name. In this case, the potentiality or Buddha-seed within each being is compared to atman, and Buddha Nature -- which is sometimes identified with the dharmakaya -- is compared to Brahman. You can find many Buddhist teachers speaking of a small mind and a big mind, or small self and big self. What they mean may not be exactly like the atman and Brahman of Vedanta, but it's common for people to understand them that way. Understanding Tathagatagarbha this way, however, would violate basic Buddhist teaching. Today, in some Buddhist traditions influence by Tathagatagarbha doctrine, Buddha Nature often is still described as a kind of seed or potentiality within each of us. Others, however, teach that Buddha Nature is simply what we are; the essential nature of all beings. The teachings of small self and big self are sometimes used today in a kind of provisional way, but ultimately this duality must be fused. This is done in several ways. For example, the Zen koan Mu, or Chao-chou's Dog, is (among other things) intended to smash through the concept that Buddha Nature is something that one has. And it's very possible today, depending on the school, to be a Mahayana Buddhist practitioner for many years and never hear the word Tathagatagarbha. But because it was a popular idea at a critical time during the development of Mahayana, its influence lingers.